Cannot restore this database because you were not authorized to back up or restore database when this one was originally backed up. Contact the database owner or administrator. This is caused by mismatch between the user information stored in the backup file and actual user account after upgrade to a newer versions of Windows. In BCM, a back-up database can be restored by the user who created database (called Database Owner) or computer administrator. After the machine has been upgraded to newer versions of Windows, SQL might complain that the user information stored in backup file is not valid. To resolve this issue, you need to run the Outlook.exe process as administrator. With Windows 7, 8 or 10, you can simply type outlook.exe in the Start search field on the Start menu and when it comes up, right click on it and choose Run as Administrator. 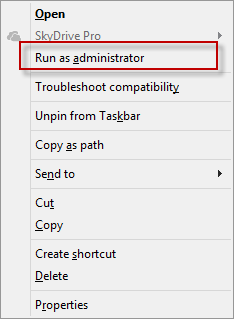 If you don't see Run as Administrator on the context menu, hold Shift+Ctrl as you right-click. This also works on the Outlook shortcut you use to open Outlook. You need to run Outlook as admin only once. After successful migration, you can start Outlook normally and use BCM. Exchange Database: How high can I go?